If you’re looking for garage ideas, specifically garage door materials and features, check out the 8 most popular garage photos added to Houzz from April through June 2017, as measured by the number of people who saved them to their Houzz ideabooks during that period. Fold and go. Bifold doors work for this Kyoto, Japan, garage. While not a traditional option, these outward folding doors have fewer moving parts than a more traditional overhead, electronically lifted garage door and usually can be operated more quickly. They aren’t for everyone though. Consider if you have enough floor space for them to operate. Wooden beauties. Instead of one large door, this Russian home has two wooden garage doors, complete with a light above each door. 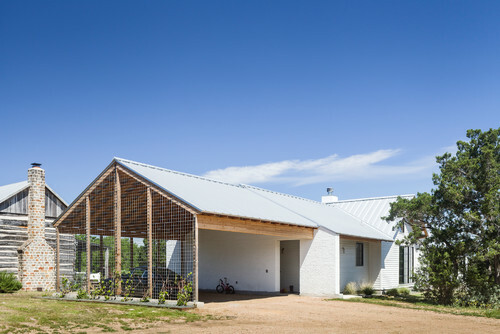 The parallel structure continues with the two separate dark driveway patches that lead up to this wood farmhouse. Copper-clad entrance. These Phoenix-area homeowners didn’t overlook the garage. Instead, they made it the largest room in the house, says Mark Sever, architect and general contractor at Sever Design Group Architects. 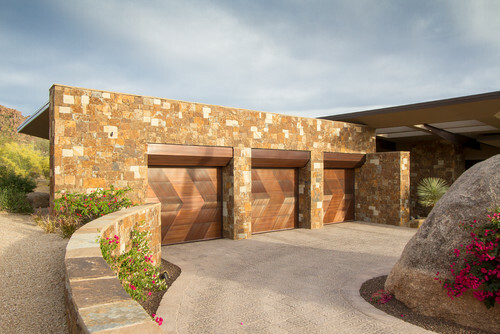 From the outside, copper-clad garage doors greet the owners and guests. Sever says they chose this garage door material because it could withstand the Arizona desert heat. Beyond the doors, a four-car garage boasts shiny floors (finished in two colors of metallic epoxy paint), custom lighting, and, perhaps most important, air conditioning. Big enough for the bikes. 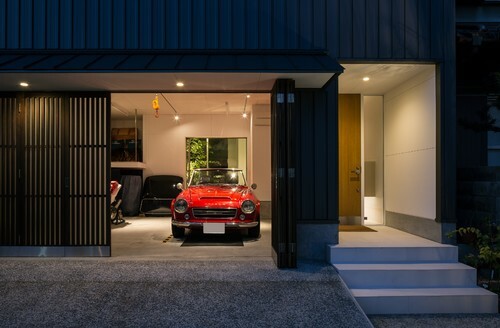 A set of doors slide open to reveal a long, skinny garage in Japan. 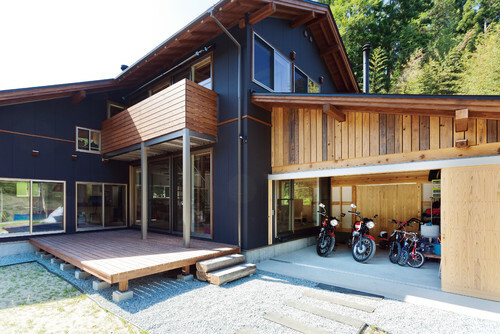 The garage sits right off the main entrance, giving this Japanese family easy access to their motorcycles and bikes. The family also didn’t try to hide the garage away from the rest of their home. Instead, one side of the garage is a large glass panel, making the garage and everything inside it visible when inside the home. Southwestern feel. 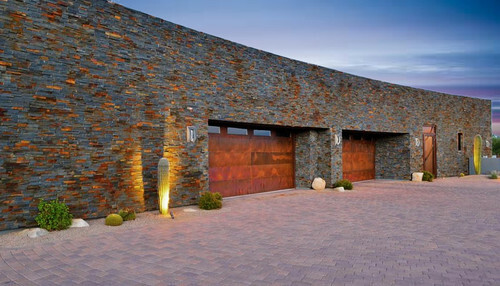 A large expanse of paved brick driveway leads up to a garage of dappled bricks and copper doors. Throw in spotlighted cacti and you have all the makings of a great Southwestern exterior, all in one part of the home: the garage. Driveway reflections. Highlight the exterior of your home by using a reflective material on your garage doors. This shine bounces around the lush green grass and turns an everyday home feature into a large piece of art. Parking on the farm. 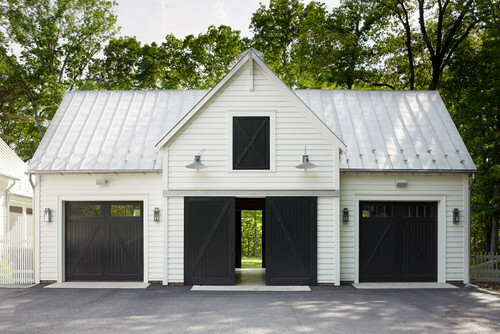 A garage fit for a farm proudly stands alongside a Richmond, Virginia, home. It offers spots for multiple cars, and you can also drive right on through if you open all the barn doors. If you’re looking to give your home a farmhouse feel, this garage will definitely accomplish that. Which garage is your favorite? Let us know in the comments below! 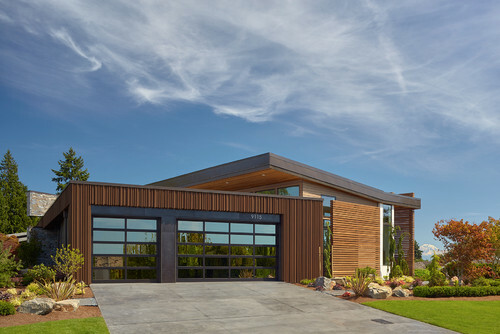 This entry was posted in Home Design and tagged aluminum full view, Amarr, amarr garage doors, architecture, building products, carriage house doors, Entrematic, exterior design, garage, garage doors, home design, home exterior, overhead doors, remodeling, sectional doors. Bookmark the permalink. All great and superb garage ideas from the different parts of the world, I specially loved the idea of the car port, the living garage, this is a great idea.